The Via Lemovicensis or Voie de Vézelay, is one of the pilgrimage routes in France to Santiago de Compostela. It comes in two main flavours and several varieties. Let’s explain this. The official Via Lemovicensis follows the historical Way to the Pyrenees and Santiago. There are many towns, cities, beautiful churches etc. on this trail. The total length from Vézelay to the Spanish frontier, Ostabat, is 900 km. One itinerary goes over Nevers. A second one over Bourges. They soon run together again. Of course, pilgrims from Holland, Belgium and western Germany have to walk to Vézelay first. Here comes in the GR654. It officially connects Namur in Belgium with Vézelay in France. The first part - Namur to the French village of Rocroi - is also covered by the Via Monastica. continuing from Rocroi to Vézelay is 540 km. In Vézelay, the GR654 is taking a different course from the Via Lemovicensis. The GR654 is much longer, because it avoids busy roads: "the meandering route that has little to do with historical pilgrimage routes", Peter Robins writes on his website. It is geared towards hikers, more than towards pilgrims. One alternative goes to Montréal, 952 km. Form there, it is another 200 km via the GR65 to Ostabat, the Spanish frontier. A second alternative takes a western direction and goes directly to Ostabat, about 900 km from the start in Vézelay. This route is popular with walkers and pilgrims from Netherlands, Belgium and Germany. It is a pretty route, passing many attractive regions in France. Detailed day to day description with map and GPX. Gronze.com is a spanish website with maps and route descriptions and spicy adds. 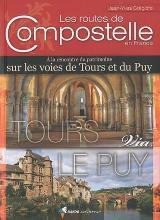 Information about the English Guides of the Vézelay route, via Nevers and via Bourges, including GPS- and PDF-files. The ultimate pilgrimage reference site by Peter Robins. Details for the first part of the GR654, from the Belgium border to Vézelay. The ultimate pilgrimage reference site by Peter Robins. Martin describes the Belgian part of the GR654. 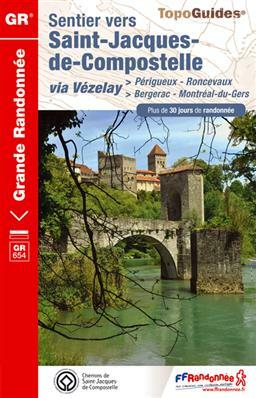 There are two, new English Guides of the Vézelay route, from Vézelay to St. Jean-Pied-de-Port: one Guide of the variant via Bourges and one of the variant via Nevers. The Guides are published by the Dutch Association of Saint James. More information > https://www.santiago.nl/english/vezelay-main-page.